That chart above pretty much sums it all up. My biggest fear came true – EUR/GBP went straight down and didn’t retest .8400 even if it only called for a small retracement. Drats! Even though the ISDA decided that no default insurance needs to be paid out on Greece, the euro was still having difficulty finding demand yesterday. Obviously, the ECB’s LTRO program was still fresh on traders’ minds and was keeping buyers at bay. The pound, on the other hand, held its own and put up good performances against the dollar, yen, and euro. So rather than retracing its footsteps to .8400, which would’ve been a shallow retracement, EUR/GBP wound up crawling even lower. On one hand, though it’s nice to see that price eventually moved in the direction that I had predicted, I sort of feel like I missed out on this golden opportunity. In retrospect, perhaps I should have made provisions and adjustments just in case the pair failed to pull back, like considering selling at the break of consolidation. In any case, I’m not giving up on this pair just yet. As Big Pippin pointed out in today’s Chart Art, both support at .8280 and resistance at .8400 are in play again now that the pair is in neutral territory. You can bet your bottom dollar that I’ll have my eyes locked on this pair waiting for prime trading opportunities to arise! On another note, shoutout to my girl Happy Pip who just bagged her 4th straight win with her NZD/USD trade. Keep it up, Happy! Thanks for following, fellas! Catch y’all on the other side of the weekend! With so much going on yesterday, I decided to sit on the bench and observe price action unfold before putting up any trades. With all the hoopla surrounding the ECB’s LTRO and Ben Bernanke’s speech midway through the New York session, I didn’t wanna get burned again by any news events. And boy, was that a good decision! I was actually keeping my eye on the .8400 handle, as I figured that it might serve as a potential resistance-turned-support level. However, thanks to a strong drop in EUR/USD, we saw the euro take a hit everywhere, with EUR/GBP sliding all the way back down below .8400! So much for potential support! For now, I’m going to stick with a short euro bias. I think that with the lack of enthusiasm following the passing of the Greek debt deal, the International Swaps and Derivatives Assocation (ISDA) meeting, and the EU Summit in Brussels later today, market players will be hesitant to load up on long euro positions. I’m waiting for EUR/GBP to retrace back up a bit to the .8400 handle. I think we could see a lot of interest here again, with other traders looking at this level as a potential entry point for their short traders. I’m going with a tight stop loss of just 35 pips. I think if price breaks back above .8400, it may signal that the pair may be headed back to the recent high around .8500. Once again, my profit target will be at support at .8280. 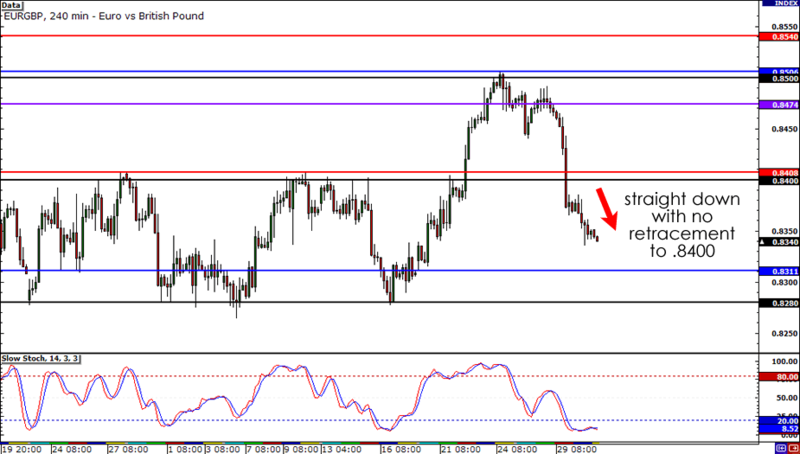 Short EUR/GBP at .8400, stop loss at .8435, take profit at .8280. I’m going to be scaling down my risk a bit on this trade and will only be risking .75% of my account. The one nice thing about this setup is that it has a very solid reward-to-risk ratio. If my profit target is hit, I’ll be taking home 120 pips, which would result in a just over 2.5% gain! What do you guys think? Will we see the pair trade above .8400 before the end of the week? 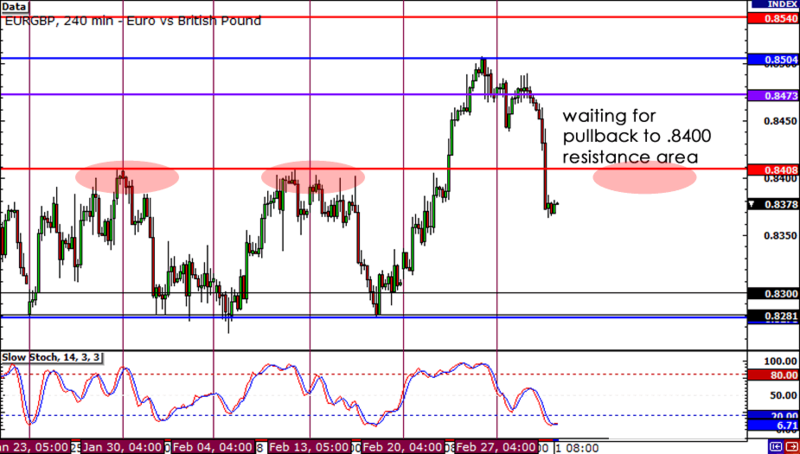 Will .8400 act as resistance on EUR/GBP again?